In a recent interview with our sister publication, Mega Visions Magazine, SEGA Network’s Mobile Games Community Manager, Danny Russell, spoke about the launch of SEGA Forever, community feedback and the future of the service. One of the key comments Danny made about the SEGA Forever service is that SEGA is open to and is “looking into” working with indie developers to bring their games to the service. Not only that, there could be a possibility of SEGA Forever working with fan translators, to bring Japan-only titles to the service. Mega Visions: I’m sure you’re aware there’s a decent indie scene on both the Dreamcast and the Mega Drive. Would SEGA Forever ever consider working with indie developers on bringing their games to the service? Danny Russell: Yes, we’re well aware of the indie scene and we’re investigating the possibility of working with indie devs in the future. There are some really great titles out there. What excites me more though, from a personal point of view, are fan translations. There are some games that I would love to see released in the West for the first time using those. The more successful SEGA Forever is, the more we can branch out like this. I would really like us to approach fan translators and to look at releasing games that have never seen the light of day in the West brought over here. 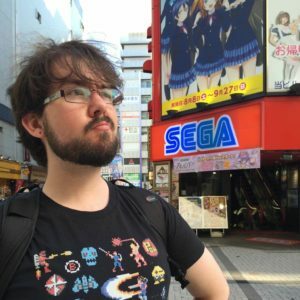 MV: I was going to ask: would SEGA ever consider translating Japan-only titles for the service? DR: We’re definitely considering the possibility of releasing games to the Western audience that were previously only available in Japan. To make this happen, as mentioned, the perfect way would be to approach fan translators who have done all this work already. We would have to see how receptive fan translators are with this kind of thing. I mean, from my point of view, there’s a Game Gear title that was only released in Japan called Sylvan Tale, which is a really cool Zelda-like RPG, but not many people have heard of it (I actually made sure there was a copy of it in the SEGA Forever ad, but you can barely see it). The fan translation available for the game is top-notch, so it’d be great to bring fan translation groups like these on board if possible. For now these are just internal discussions though. We’re not in that phase at all yet, but SEGA Forever is here to stay and this is definitely on the list of things we’re keen to make happen. So it looks like we’ll have to ‘watch this space’ to see if SEGA Forever does start accepting indie titles. MV: How soon are we likely to see games from other platforms (not Mega Drive/Genesis) appear on the platform? DR: I don’t want to make any promises… I would say that you’re probably not going to see Saturn ports this year, but everything else is on the cards at the moment. So it looks like we’ll be seeing SEGA games from every console, except Saturn, by the end of 2017. However, that’s not necessarily final – SEGA might be able to work its magic and bring Saturn titles sooner. And if you’re wondering why it will take so long, Danny mentioned in the interview that SEGA will be looking to port Dreamcast and Saturn titles, rather than emulate them, which will no doubt add to the time it takes to bring Saturn games to the service. But they are coming. The full interview features many more exciting ideas around SEGA Forever and will appear in Issue #4 of Mega Visions Magazine (Mega Visions Magazine is a digital, interactive magazine available on iOS, Android, Kindle Fire, Windows10 and browsers).